NANCY MAC: ONE OF A KIND SHOW WINTER 2018 | SOME OF MY PICKS FOR THE HOLIDAY SEASON! ONE OF A KIND SHOW WINTER 2018 | SOME OF MY PICKS FOR THE HOLIDAY SEASON! And just like that, the One of a Kind Show has come around again! This year was a little bittersweet for me because I've actually worked the show as a vendor for many shows, and this year was the first year I attended strictly as media. I love the One of a Kind Show and supporting all of the artisans that exhibit in it. Since I've been a part of the show for many seasons now, I love seeing old vendors return for another show, and I love walking around to check out the new vendors just as equally! Just like previous seasons, I went a bit crazy and left the show with quite a haul. 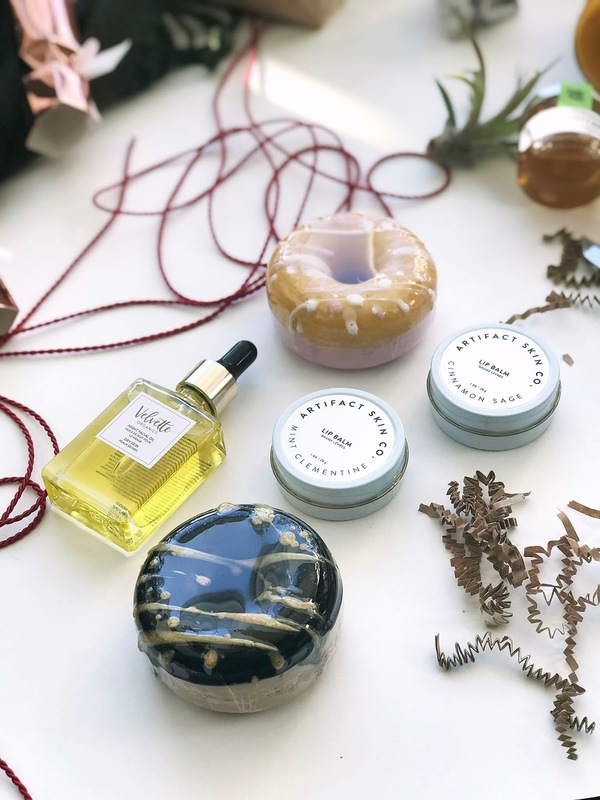 I picked up a few oldies, a few products from companies I've never purchased from before, and I think all of these would make great gifts and/or stocking stuffers. Keep on reading to see what my top picks are from the One of a Kind Show! I first stumbled upon Velvette Organics at the Spring 2018 One of a Kind Show and just recently ran out of my night time face oil so naturally, I had to visit their booth to pick up a new one. I think this is such a luxurious gift, and all of their ingredients are natural and organic. They even have hair oils, and face oils for normal and mature skin. Definitely worth checking out! 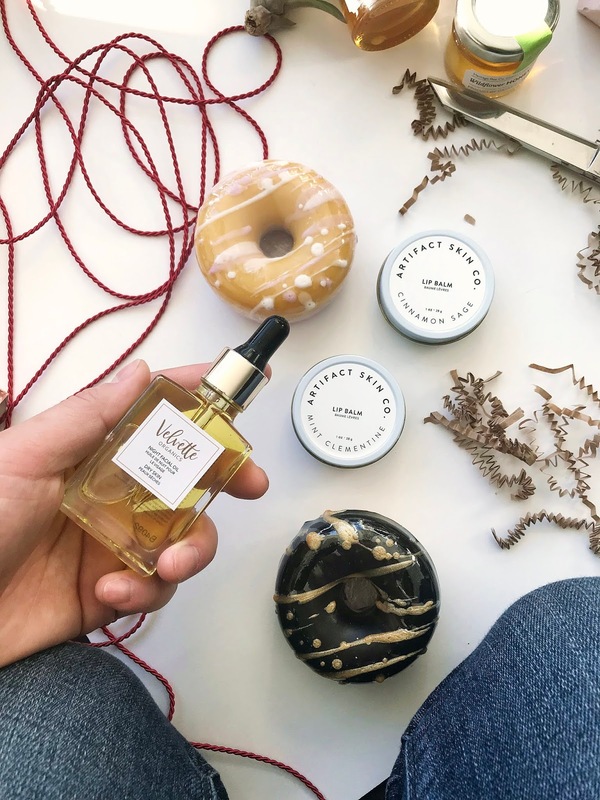 Artifact Skin Co. has been a vendor for many years and although I've always been intrigued by their products, I've never actually purchased anything. They carry face masques, hair products, bath products, and so much more. I thought these lip balm tins would make great stocking stuffers, and not to mention, their packaging is #goals. I got the chance to chat with demo soap for a bit and found out their studio is located just in Liberty Village. They literally have the cutest soaps, and who doesn't love getting soap? I picked up sugar cookie and lemon raspberry scented donuts to put in some stockings. They also carry bath bombs and other types of designs and sooo many scents. I got the chance to chat with Carolyn for a few minutes about the show, about made in Canada, and so much more. This is one of the reasons why I look forward to the show every year: the sense of community. I buy cards from Carolyn from every year although I've never featured them in my hauls! 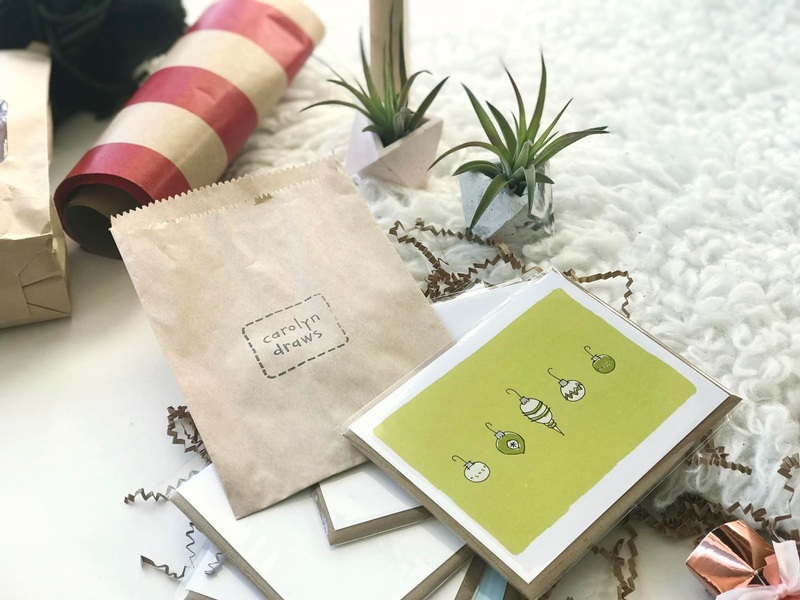 She has the best cards for so many occasions in your life, and her new holiday cards are pretty cute too. Last year, I purchased a very minimal "I love you more than poutine" card for my anniversary and it's been my favourite card I've ever purchased. Really... need I say more? We all know how much I rave about these planters. A husband and wife run company, they're based in Hamilton and carry the cutest concrete planters in varying sizes. I picked up two this year to give away as gifts, but it's likely I'll be collecting them for years to come. All of their planters also come with a plant so that's a bonus! So when I used to work the show, I would literally go get one of these bags every single day. These are just so yummy and there's about five or six different flavours. My favourites are the smokey maple bacon, and the white truffle. These are perfect for holiday stockings, or just as a snack as you're walking through the aisles at the show. Mmm, honey! 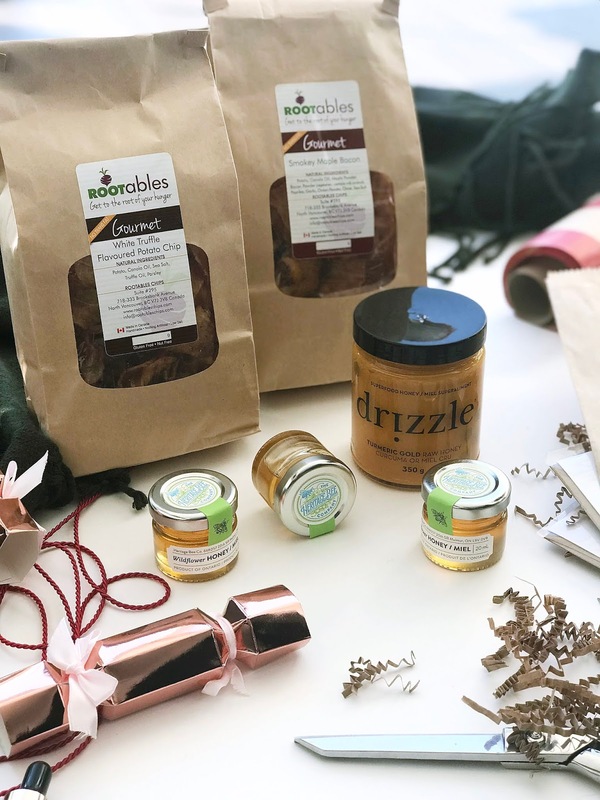 Drizzle is a craft honey company from Calgary (my hometown woot!) and they're a company I've been following or quite some time. I've always wanted to try their honey so seeing them at One of Kind was definitely a welcome surprise. A nice jar of honey would make the perfect hostess gift for those holiday parties you're attending. I picked up the turmeric jar but they also have a cinnamon spiced honey which is sooo holiday-esque. I also got the chance to talk to Debbie, founder and beekeeper of The Heritage Bee Co. and learned so much about her company, how their honey is produced, and what they stand for. They're so passionate about their work, and their honey also tastes amazing. They practice all natural beekeeping and also offer tours and more at their apiary! I thought a set of three minis would make the perfect addition to holiday gift baskets, and they also have full size jars of other flavours too. So there you have it! My bi-annual One of a Kind gift guide. The show runs from now until December 2nd at the Enercare Centre. 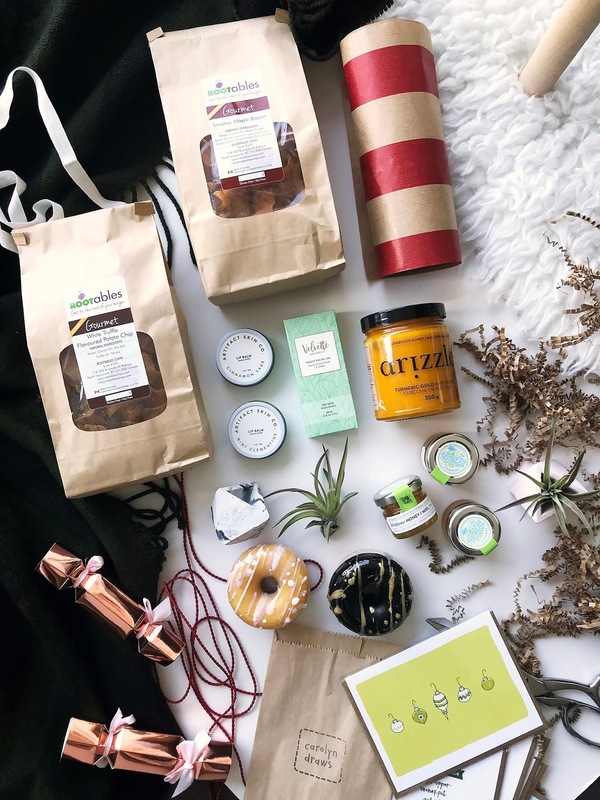 Let's try to shop local this season and support all of these amazing makers! Disclaimer* While I received a media badge to visit the One of a Kind Show, all products were purchased with my own money. The donut soaps are so cute! Thank you Kayla! They smell amazing too!